Above you'll find all the links to the previous binding posts. 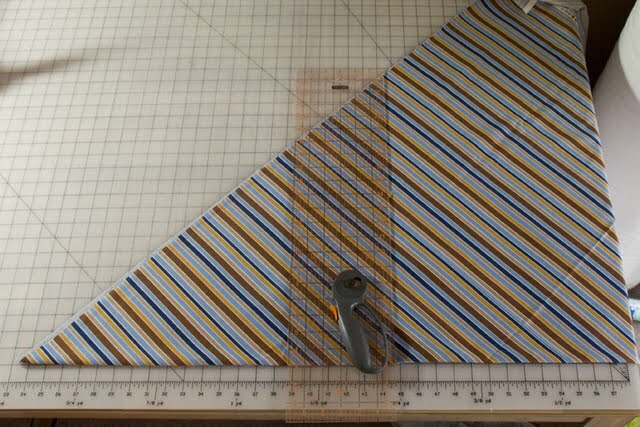 Cutting individual bias strips with a rotary cutter. This method is faster for cutting the strips but can yield more waste. 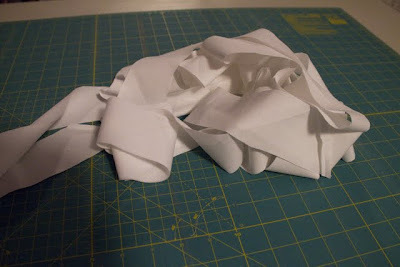 It works very well if you have a fabric that you want to make a large amount of binding from for multiple projects. 1. 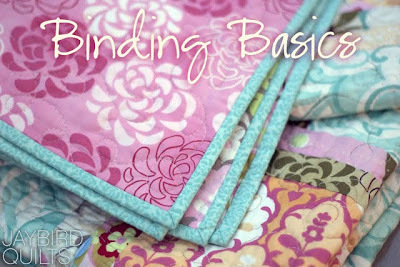 Determine how much binding that you'll need for your quilt or project. Directions on how to do this are in post #1 if you need a refresher on the math. For this method a 1/2 yard of fabric will yield approximately 315" of binding at 2.25" wide and 280" of binding at 2.5" wide. More details on how to calculate fabric size to binding yield are shown below. 2. 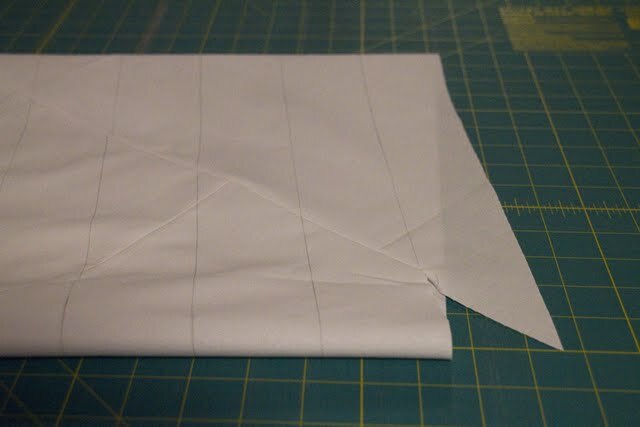 Square up the cut side of your fabric. 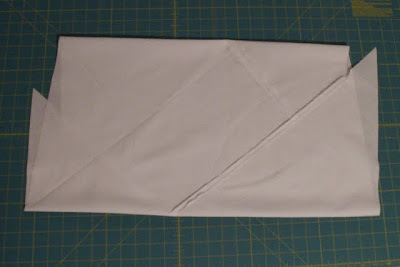 Take the cut edge and fold it over on top of the selvage edge to create a giant triangle. 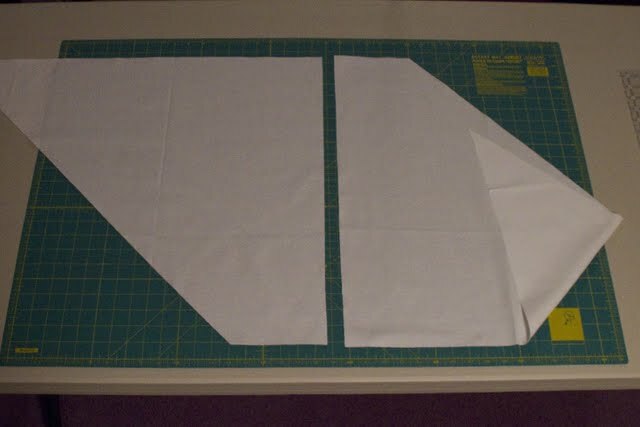 Place the fold at the bottom of your cutting mat facing you. Place your 6"x24" ruler as shown and make one long vertical cut. Make sure to keep the ruler square with the bottom fold of the fabric. 3. Place the fabric from the right to the side for now. Take the triangle that you just cut from the left and flip it to the right. The fold should still be facing you at the bottom. 4. Begin to cut your strips from this triangle. I cut my binding strips at 2.25"
5. 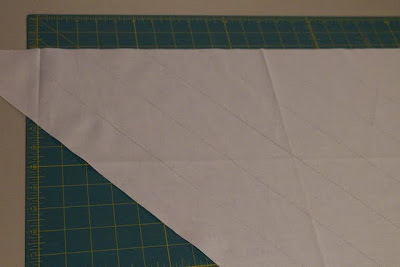 Keep cutting until you get close to the end of the triangle. 6. 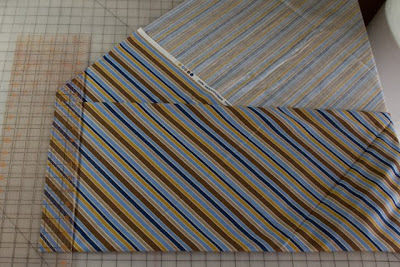 You can keep cutting to utilize as much fabric as possible but I personally don't like using the pieces that are much smaller than this as you end up with a lot of seams in your finished binding strip. 7. Bring back the piece of fabric from the beginning that you set aside. Fold up the bottom to create a second fold. Make sure that the folds are parallel to each other so that your strips stay straight. 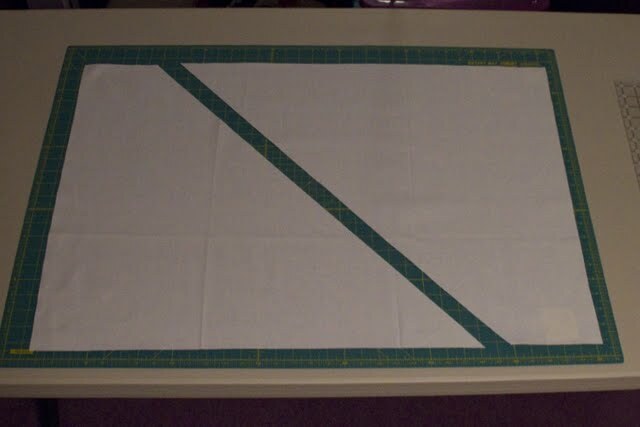 Continue cutting off strips until you have enough for your quilt or cut up all the fabric if you like the binding for more than one quilt. Personally I'll usually cut an entire yard at a time. 8. 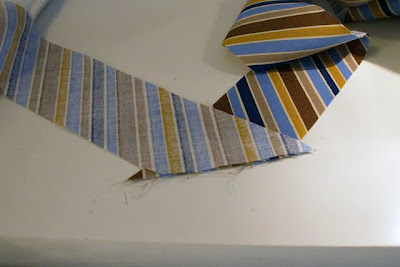 Match the ends and sew them with a 1/4" seam. More details on this are in post #1. 9. Press the seams open & trim off the dog ears. 10. 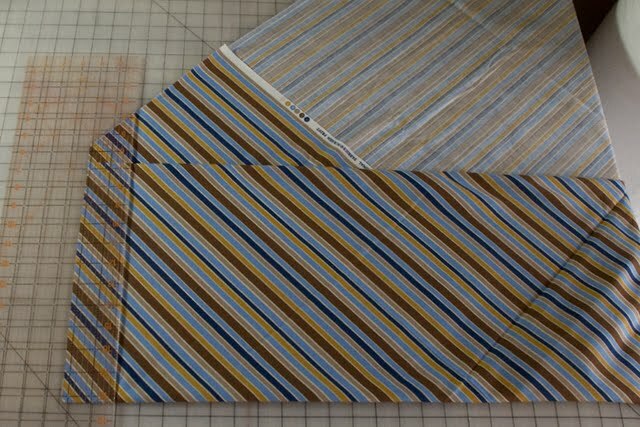 If you are making double fold binding now is the time to fold & iron it in half. 11. Wrap up the binding until you are ready to finish your quilt. Making continuous binding. 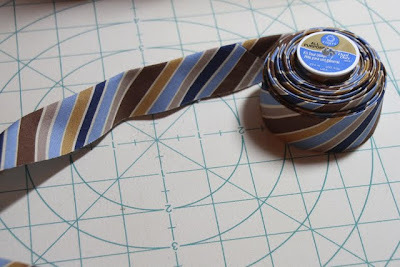 This method is a bit slower as it uses scissors over a rotary cutter. It doesn't yield much waste and once you are done cutting all of the seams are already together. 1. Determine how much binding that you'll need. Directions on how to do this are in post #1 if you need a refresher on the math. 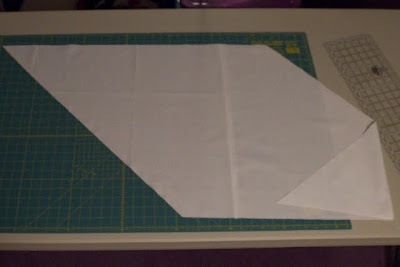 The chart below shows you how to calculate the size square you'll need to use to make enough binding. 20" Square = 175" 20" Square = 155"
24" Square = 250" 24" Square = 225"
30" Square = 395" 30" Square = 355"
36" Square = 570" 36" Square = 515"
40" Square = 700" 40" Square = 635"
Want to calculate what size square is best for you? Here is the math. Take the square root of A and round up. Ex: 450" of binding needed x 2.25" width = 1012.5"
Take the square root of 1012.5" which is 31.81 and round up to 32. To get 450" of binding at 2.25" wide I'd need to start with a 32" square. Note: This method does also work with a rectangle, it's just a bit harder to work the math out. 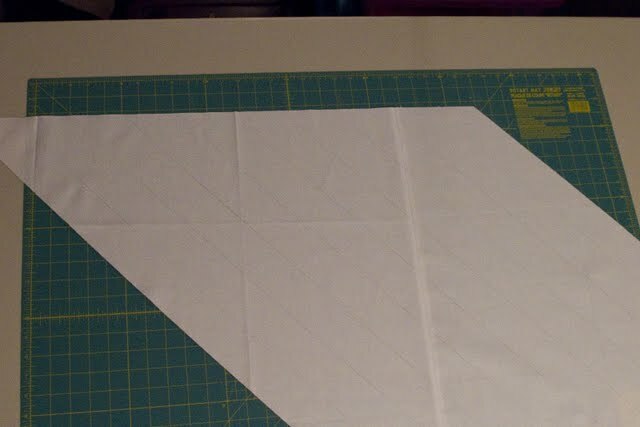 In general if my math says to use a 32" square I'll use a 32" x 40" rectangle to make the most of my entire WOF of fabric. 2. Place your square or rectangle on your cutting mat. 3. 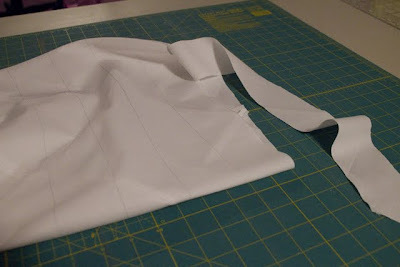 Make a 45 degree cut in your fabric. If you are using a square make this cut from corner to corner. if you are using a rectangle you can start in one corner or make the cut more in the middle as shown below. 4. Switch the left and right pieces so that they look like this. 5. Pin the center and sew the two pieces together with a 1/4" seam. Press open. 7. Another photo to show you the lines. 8. Next comes the pinning that will feel really odd till you get used to it. You are going to make a tube by matching the two SOG sides. you need to match the drawn lines from one side to the other. 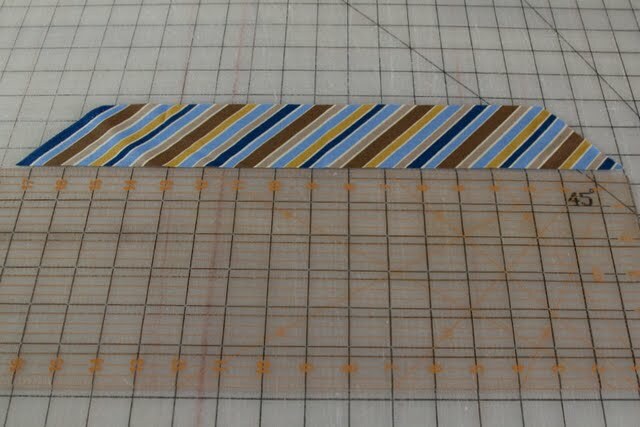 The tricky part is that you need to offset this seam by one set of drawn lines so that you are making a continuous strip and not lots of small loops. 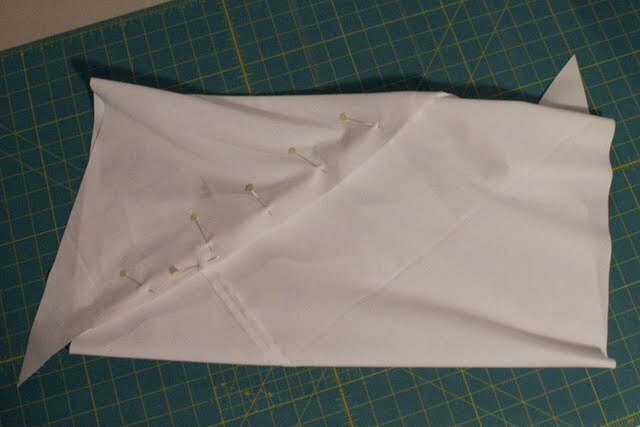 Once you have it pinned sew with a 1/4" seam and press the seam open. The photo in step 10 shows how the offset will end up. 9. This is what it should look like after it's sewn and the pins are removed. 10. Now use the drawn lines to cut the binding strips apart. Unfortunately because of the way the tube is constructed you can't use a rotary cutter for this step. 11. Keep cutting... this takes a bit of time. 12. Eventually you'll have a pile of binding like this. 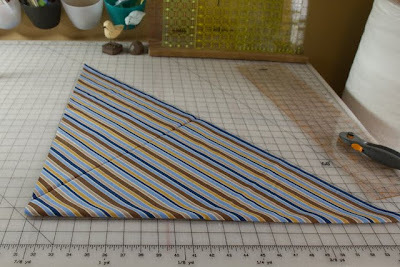 The advantage of making the strips this way is that they are all pieced together by this point. 13. 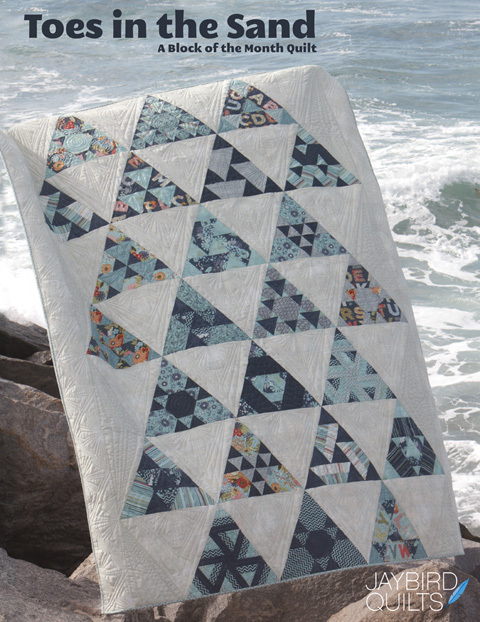 Fold in half WST and use the binding to finish a quilt! 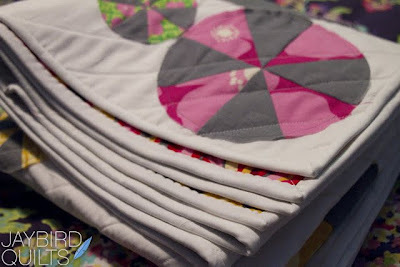 Directions on how to put the binding on a quilt can be found in my perfect binding tutorial post. 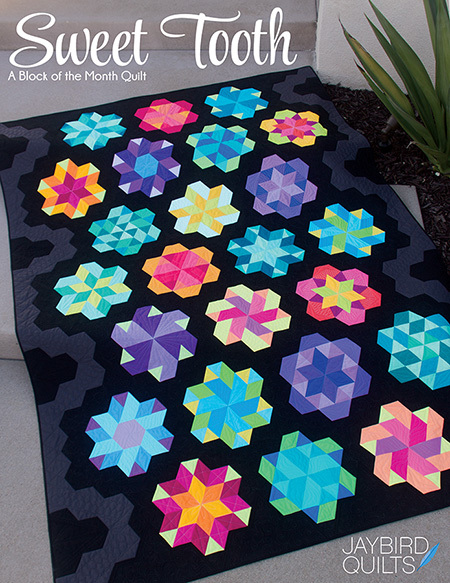 More on this quilt later today! Still to come in future binding posts. Another great tutorial Julie. 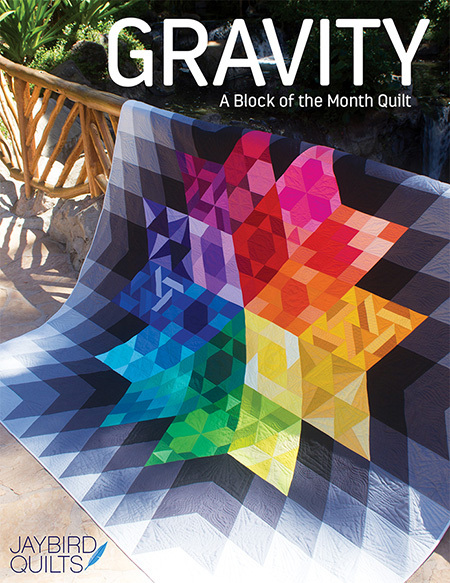 I really appreciate the math, even after as many quilts as I have made I have to sit down and figure it out each time. Thank you thank you! The tube method (i your second part) is all I have ever seen and it does not compute with me. The top method you showed looks easy as pie! I can do that! Thanks for these tutorials, they will really help. Not sure which method will be easier for me but I will try both and make decision then. I love making continuous binding - my method is slightly different from your method. 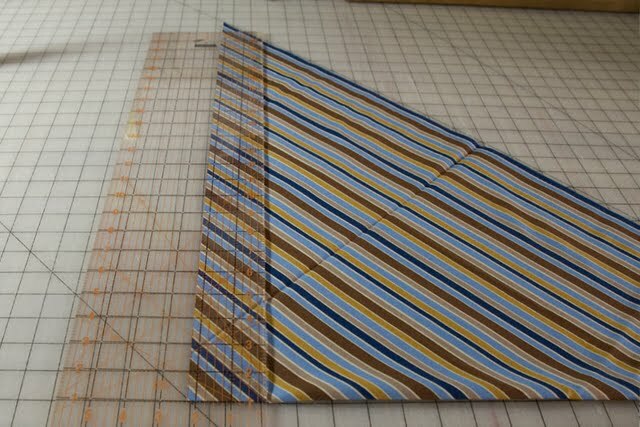 An invaluable resource for making continuous binding is the Quilter's Strip Ticket - a simple laminated piece of red paper containing a table for the size fabric square required to make a specific length of binding at a specific width - if the house were on fire - I would grab this! Printed by Lamb Art Press (http://www.softexpressions.com/Merchant2/merchant.mvc?Screen=PROD&Product_Code=02RQ&Store_Code=CQMEASE). 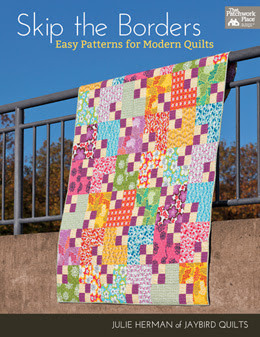 The back of this contains step by step instructions for making continuous binding. 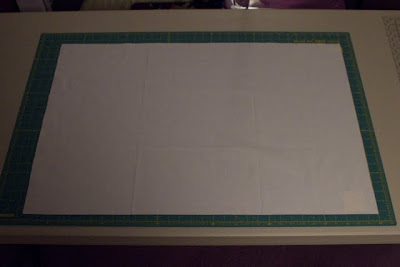 Another tip - buy a smaller cutting mat - when you cut your bias tube slip the smaller mat into the tube and then use your rotary cutter to cut your bias strips - you never need scissors to cut continuous binding. Man, I love your stuff!!! You always do great things!!! I just wanted to add that the spool is nice but if you want to invest in a little more... there is a "binding buddy" that Joann carries. I think when you used the coupon, it makes it around $5/6. It has a "necklace" type thing. So, you can wind your binding around it (and it has a clip to keep the binding in place while you wind) and hang it around your neck like a necklace. It really is nice. It is near the automatic binding tool they came out with a couple years ago. thank you, thank you, thank you for the math. I'm an English teacher turned quilter and the math is the part that always kills me. But, on the upside, I usually buy more fabric than I rally need because I'm scared to run out. 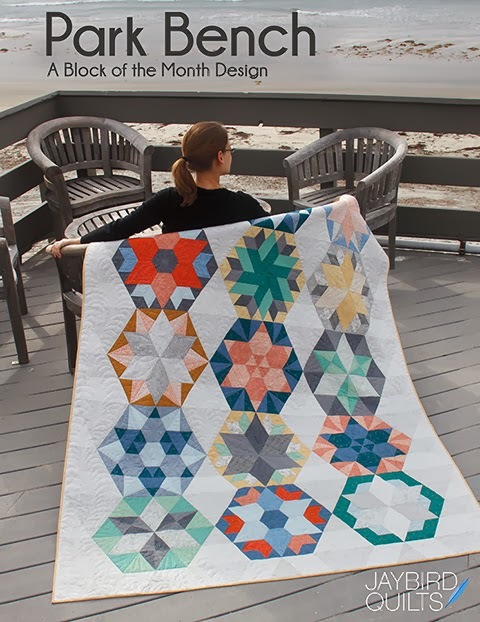 This means lots of fun scrap quilts. These tutes are amazing. Thanks again! This is truly awesome Julie! Thanks so much. I was just trying to figure the math for binding my king quilt and would have totally wasted a lot of fabric without this. And thank goodness for google too - 'cause I can't figure the square root of anything anymore. hahaha! i never like the method 2 because it has to be cut by scissors but for small items finishes like a pouch or pencil case is great enough...however your binding tutorials are really awesome. Thanks for sharing your knowledge. thank you! 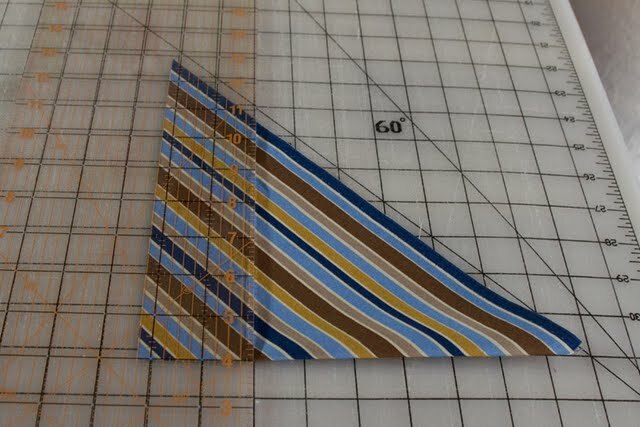 I have decided I do not like to make mitered corners, so I think I may just do bias binding from now on and do curved corners. Thanks a million for a great tutorial! 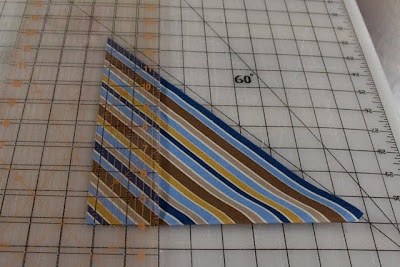 Until now, I've dreaded cutting the bias strips for binding. 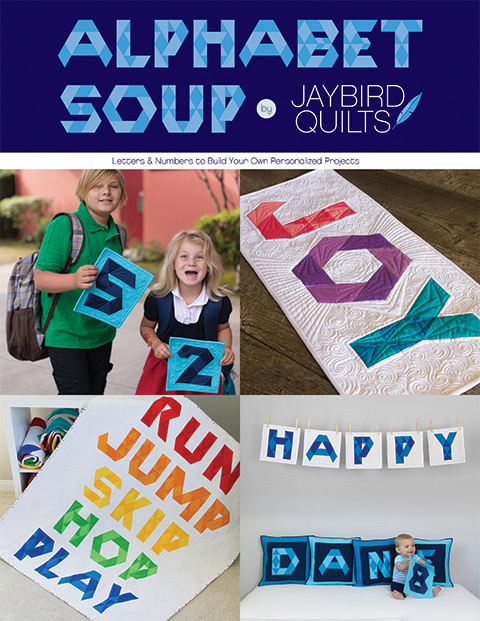 I used your method this morning and love it -- you've put joy into this part of quiltmaking for me! Julie, your binding tuts are great! Thanks for all the photos and time it took to provide this most helpful info! just to add, I am now subscb to yr blog post by email so I save the email in my iphone and whenever I have to be in "waiting" mode, I like to read up your tutorial because it comes with pictures...lots of them. Love it! Cutting bias from a square is the easiest way I have cut binding eve- straight or bias! I will be linking to your bias tutorials in my little quilt-a-long. The quantities table is also invaluable, thankyou! I finally did this today. I wanted to share that I put an old magazine inside the tube as I cut and it made it easier to avoid cutting the bottom layer. I just sort of slid/rotated the fabric tube around the magazine as I went. Hey Julie, I know this is an older post but did you know there IS a calculation for WOF bias!! 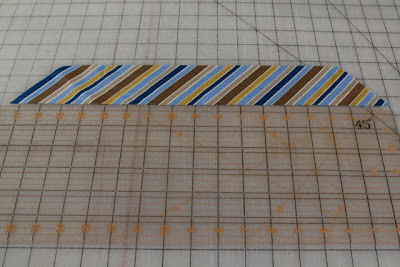 B*2.25 (or width of strip desired)= fabric needed (round up!!)!! It sounds harder than it is! But it the math works!! Thank you for all of your hard work! I am struggling to understand all the folding in Method #1. Do you have a youtube video that demonstrates this technique?